As I progress through this recovery there is one thing that I find truly striking. Learning to recognize, acknowledge and feel my emotions has lead me to understand how I have never developed deep relationships with people and how I feel loneliness to my core. The incredible thing is as painful as this is, it is somehow dramatically more ‘tolerable’ and somehow feels ‘ok’ as compared to that hollow, dark, feeling of despair that comes from believing you are different and living life looking through a window at others. The loneliness somehow feels natural, whereas that feeling inside when you believe you stand alone as an exception–that feels completely bottomless and frankly unsolvable. Dear RL, I love the way you explained CEN recovery. I have had the exact same feeling and experience that you describe. Thank you for putting it in words that are so descriptive for people to understand. Take care! Dear Stuck, before worrying about connecting with others, Step 1 is to connect with yourself. Pay attention to yourself in every possible way, especially emotionally. 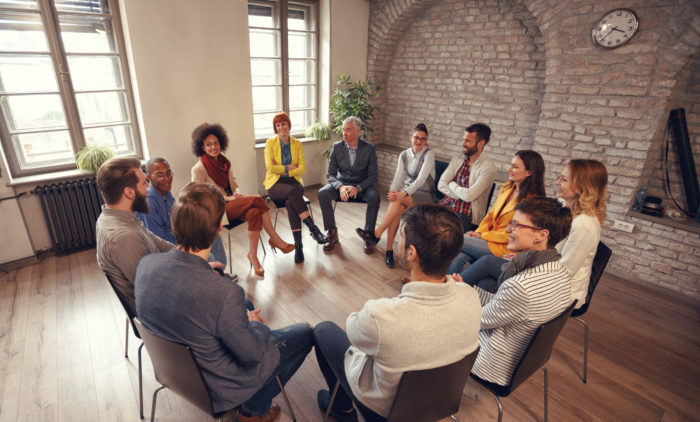 By doing this, you’ll gradually become more comfortable connecting with others. As Jonice has said, getting in touch with yourself is the important first step. May I suggest yoga? The main purpose of yoga is to help you get in touch with your deeper self and this starts with tuning in to your body. Dru yoga is especially helpful for this. If you haven’t practised yoga before, make sure you find a gentle class and a teacher with whom you feel really comfortable. Try a few classes, if necessary. Once you’ve found a class you like, stick with it but take it slowly. I wish you all the best. Excellent suggestion! Thank you Felicity! I personally want to thank you for your work in CEN and for bringing awareness to this issue. 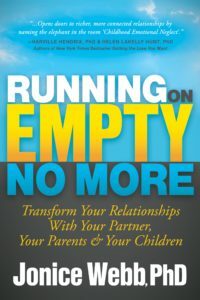 As a therapist and a person who experienced CEN, your book, “Running on Empty” was truly a Godsend. It helped put the pieces of the puzzle together for me. I could not understand why I felt the way I did in my adult life. My mother had MDD (my own diagnosis of her) and spent the majority of my childhood in bed, medicated on Valium. My emotional needs were never acknowledged, let alone met. I remember feeling suicidal and hopeless . . . as a young child. As a teenager, I chose a friend who was abusive toward me throughout all of my public school years. As an adult, I chose a (first) husband just like my mother: aloof, abusive, emotionally distant. Thankfully, things began to change when I divorced after 22 years, and a year later, met a man, (and married) who demonstrated unconditional love and helped me in my healing process. I returned to college at 51 and completed a BSW and MSW, and now have a private practice. I am grateful for my personal experience in CEN, because I can easily identify it in my clients. I frequently discuss CEN with them and have recommended your books often. 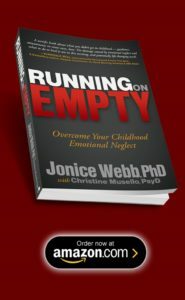 From my professional experience, there are so many walking wounded out there who suffer from CEN and do not have a clue as to why they feel so empty. I am grateful to you for your work and will continue to educate my clients and people in general about CEN. So important to understand one’s framework of behavior and feeling in this matter. Blessings! Dear Karen, I’m so glad you’re helping CEN people. And I couldn’t be more pleased to hear that my work has been helpful to you personally. Please do keep up the good work! I discovered your work on April 12th and I can already tell you that you’ve changed my life. I’ve spent years trying to work out what on earth was wrong with me, constantly doubting myself and being unable to develop a consistent sense of who I was. Wanting to seek counselling but feeling like my issues weren’t serious enough, despite them having cost me a place in a top UK university, and a lifetime of guilt and insecurity. Through sheer will alone I pulled my life together from the depressed mess I used to live in, but after 3 months I realised that it didn’t make me feel any closer to the rest of society — still feeling like an outsider looking in, still feeling like I wasn’t living for myself. I’ve tried and tried and tried to fill this hole for so long, without ever really knowing if it existed. Without wanting to be too grim, I recently walked through the same forested area each day for over a week thinking how it would be a good place to just hang myself and put an end to the confusion and loneliness. Fortunately, one of those days I asked the right questions, and I found your work. I’ve cried every day since as I think about how it explains literally everything I’ve been struggling with, and probably listened to ‘Numb’ and ‘Crawling’ by Linkin Park over 100 times each haha. You’ve truly given my life meaning, and I sincerely and deeply want to thank you for what you’ve done for me. I’ve ordered your book, I’m seeking therapy to make sure I address everything, and if I pull my life together from hereon out I hope I can get to meet you one day and thank you in person. Your work deserves far more attention and I’m going to try and spread the word for the sake of those who are suffering a similar fate. Thank you. I could not be happier reading your comment Callum. And good for you! Stay on this path and you will get somewhere good.